Six months ago, NIH launched the Helping to End Addiction Long-term (HEAL) initiative, a bold trans-agency effort to catalyze scientific discoveries to stem the opioid crisis. 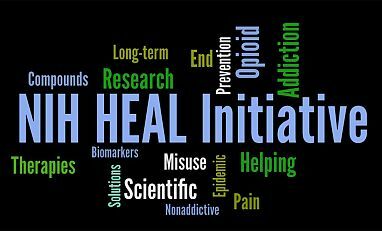 HEAL will support research across NIH, using $500 M of FY 2018 funds, to improve prevention and treatment of opioid use disorder and enhance pain management. Through HEAL, NIH will harness the power of science to bring new hope for people, families, and communities affected by this devastating crisis. The current menu of evidence-based prevention, treatment, and recovery interventions has not been fully implemented nationwide. An unacceptably low fraction – about one fifth -- of people with opioid use disorder receive any treatment at all. Of those who do enter treatment, only about a third receive any medications—which are universally acknowledged to be the standard of care—as part of their treatment. However, even when medications are used as a component of treatment, the duration is typically shorter than clinically indicated, contributing to unacceptably high relapse rates within the first 6 months. To take on this challenge, as part of the broader HEAL initiative, NIH has partnered with the Substance Abuse and Mental Health Services Administration (SAMHSA) to launch the HEALing Communities Study. This study will evaluate the impact of implementing an integrated set of evidence based practices for prevention and treatment of opioid use disorders in select communities with high rates of opioid overdose mortality, with a focus on significantly reducing opioid overdose fatalities by 40%. Targeted areas for intervention include decreasing the incidence of opioid use disorder, increasing the number of individuals receiving medications for opioid use disorder treatment, increasing treatment retention beyond 6 months, receiving recovery support services, and expanding the distribution of naloxone. Toward this goal, today NIDA issued funding opportunities for cooperative agreements for components of the HEALing Communities Study: a data coordinating center and up to three research sites to measure the impact of integrating evidence-based prevention, treatment, and recovery interventions for opioid misuse, opioid use disorder, opioid-related overdose events and fatalities across multiple settings, including primary care, behavioral health, and justice. We also encourage evidence-based interventions for prevention and treatment that involve community resources such as police departments, faith-based organizations, and schools, with a focus on rural communities and strong partnerships with state and local governments. The evidence we generate though the HEALing Communities Study, the most ambitious implementation study in the addiction field to date, will help communities nationwide address the opioid crisis at the local level. By testing interventions where they are needed the most, in close partnership with SAMHSA and other Federal partners, we will show how researchers, providers, and communities can come together and finally bring an end to this devastating public health crisis. THIS study (funded by the NIDA) showed that participants of IBOGAINE therapy, (45%) reported a decrease in opioid use after the treatment, while 36% reported never using opioids again and 15% reported no change in their opioid use. Four percent reported an increase in opioid use. During his work on this study, Dr. Davis was initially funded by an National Institute on Alcohol Abuse and Alcoholism training grant (#007747) and subsequently an National Institute on Drug Abuse training grant (#007209). The result: TEN TIMES more of the participants, after ibogaine therapy, showed a REDUCTION than the few who increased their opioid use. Yet this GAME CHANGING plant goes unused. As noted, NIDA did fund research on ibogaine (a hallucinogenic West African shrub) as a potential treatment for opioid addiction. This research was discontinued because ibogaine was determined to be neurotoxic and thus unsafe. Treatments for addiction (like other medical treatments) must not only prove effective but must also not pose significant risks to the patient. Even though ibogaine is used in some other countries, it is unlikely to become a federally approved drug-addiction treatment in the U.S. for this reason. NIDA continues to support research into other natural and synthetic compounds that could help treat addiction more safely. I completely support this integrative effort offering efficacious care over a longer period of time. However, when we examine our human anthropological record, some of our kind are consistently quite enamored w/ psychoactive substances that alter the mind, mood and motor (behavior). With over 40 years experience as a clinician in BHC, the prognosis for a drug-free world is grim. NIDA. "The HEALing Communities Study: Using Science to Address the Opioid Crisis." National Institute on Drug Abuse, 19 Sep. 2018, https://www.drugabuse.gov/about-nida/noras-blog/2018/09/healing-communities-study-using-science-to-address-opioid-crisis. NIDA. The HEALing Communities Study: Using Science to Address the Opioid Crisis. National Institute on Drug Abuse website. https://www.drugabuse.gov/about-nida/noras-blog/2018/09/healing-communities-study-using-science-to-address-opioid-crisis. September 19, 2018.